What is the Purpose of this program ? India has the potential to become the world’s 3rd largest economy in the next 20 years. The responsibility of making this happen is on the young shoulders of our youth of today. The Lodha group envisages building a very strong foundation to convert this thought into reality. Using the Lodha World Schools as a platform the Lodha Foundation would like to foster and support the meritorious students with financial needs and encourage them to contribute to the development of India. What is the Structure of the Program ? How will my child benefit from this program ? What will happen in the Mentorship Module of the Program ? What is the Sponsorship Module of the Program ? 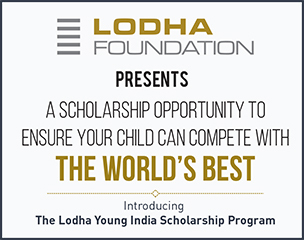 What is the Lodha Foundation International Study Program ? What are the Key Criteria for Selection of a candidate ? What is the procedure for applying to this program ? Where will I get the application forms ? •	The applications need to be submitted at Lodha World School Thane or Palava, between 14th of Dec 2015 to 6th of January 2016.